This year is seeing a lot of growth for me as a blogger, and that includes joining with companies like Purex and Dial as a reviewer. It’s exciting! 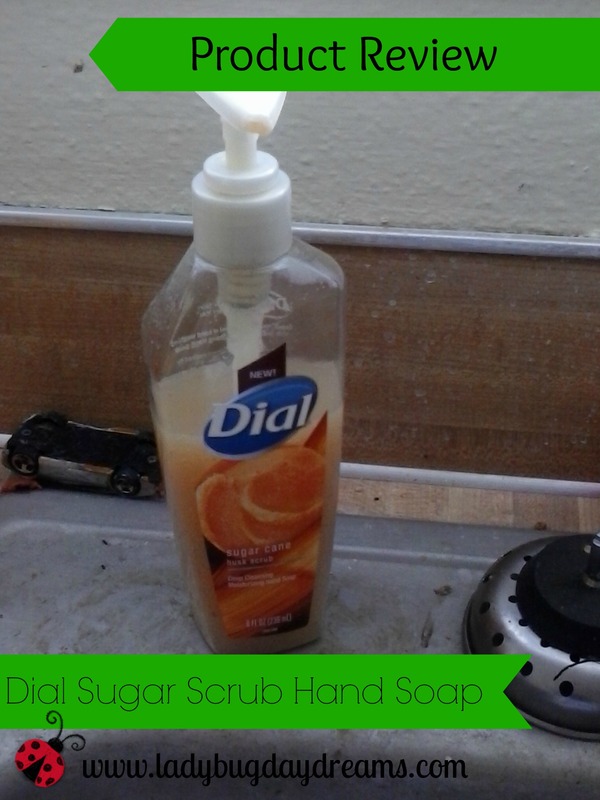 I’ve always enjoyed Dial products, so I was interested in using and reviewing their new Dial Sugar Cane Husk Scrub Deep Cleansing and Moisturizing Hand Soap. I initially put the bottle in the kids/guest bathroom, but it was clear after not very long at all that that wasn’t going to work long term. You see, Small Fry did not like this soap at all. I’m not sure why, but every time he went to the bathroom and had to wash up afterwards, it was a fight. He just prefers our bar soap instead. So I quickly (after just a few hours) moved the Dial to the kitchen, where it’s found its home ever since then. So, because of this move, I was the main one who used this soap. Everyone else pretty much washes their hands in the bathroom, but I have to wash my hands in the kitchen frequently during cooking, and it was nice to have a simple soap pump there for doing so (as opposed to just using dish soap, which is what I usually do). I really liked the feel of this soap, too. It’s full of “scrubbers” that feel really nicely on your hands. I just love the feeling of having my hands scrubbed by texture in my soap. But there weren’t too many scrubbers, either. I would have been happy with more of the scrubby “balls,” but as it is, it’s a nice amount. It’s not so much that it would be overwhelming for sensitive hands, but there are enough to make your hands feel lovely after washing. The only thing I didn’t like about this soap was the scent. I can’t quite place what it smells like, but I didn’t like it. It’s not enough to deter me from use because the soap feels so nice, but next time I try it out, I’ll try a different scent (probably the yellow raspberry/black sugar). Also, quick disclaimer on the scent: I’m perfectly willing to admit that my aversion to it might be first trimester sensitivities. Please don’t let my opinion on the scent dissuade you from trying it.